Mrs. Rima Daniel Hourani ‘70 is of Palestinian descent and has found a way to pay homage to her roots by giving other Palestinian students the opportunity to earn a university education. This anonymous proverb illustrates how the act of giving enhances joy and represents a heightened form of virtue. 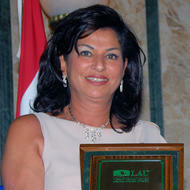 LAU alumna Rima Hourani and her husband Amal have expressed their dedication to such principles by ensuring that the fruits of their labors are shared for the benefit of others. Since their first donation in 1993, the couple has contributed significantly to various endeavors at LAU. “It is always important to give to others, so those who are less fortunate can have the chance of a better life”, Mrs. Hourani said. “We chose to give financial aid to Nursing and Pharmacy students because the students graduating with degrees in those two fields will work and provide much needed help in the ever-demanding health care sector. These are professions that heal people”. Following the rise of the Byblos campus, Amal and Rima Hourani decided to donate a sizeable amount towards naming the Rima Hourani Exhibition Room on that campus. Then, upon hearing word of plans to build a new School of Business on the Beirut campus, they generously gave a large sum that went towards naming the Amal Issa Hourani Lounge.